A very exciting opportunity has come up (to be discussed if and when confirmed!) but this is just a quick post to share the work I’m doing today on developing a physical showcase for my jewellery. The idea is to create a self-contained desktop display environment that I can use to showcase examples of my jewellery work – earrings, necklaces, pendants, brooches, bracelets, cufflinks and so on. Due to my recent acquisition of a fabulously gigantic cardboard box from a friend’s recent extravagant TV purchase, I plan to use cardboard as the construction material, and brown paper as the design/background theme. I’ll see how it comes together. 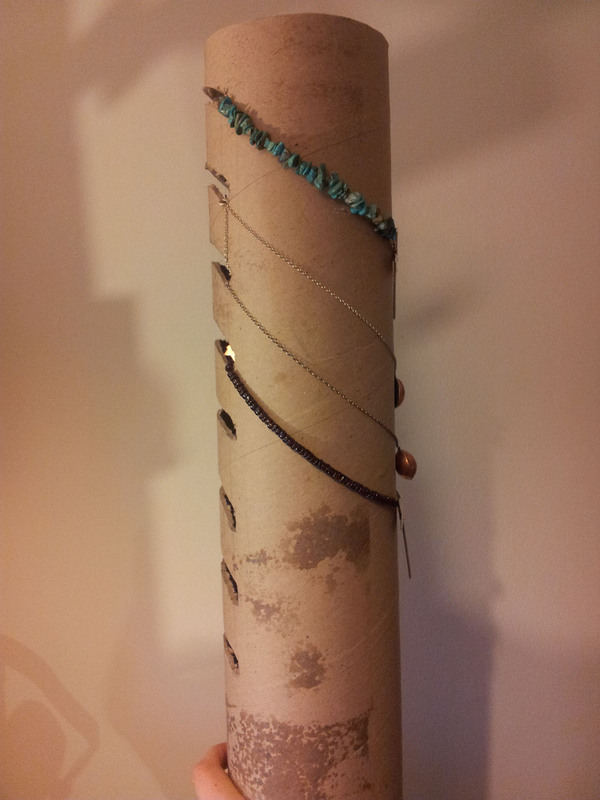 For now, here’s the necklace display I’m working on today. I’m structurally very happy with it, although the carpet core tube will need to be covered in brown paper to hide the yucky glue marks.